It's been a busy day today. Our Scion Event is going through it's last planning stages. I have spent the last couple of hours posting the event in all the different Scion forums in the Mid Atlantic, Virginia, Maryland areas. 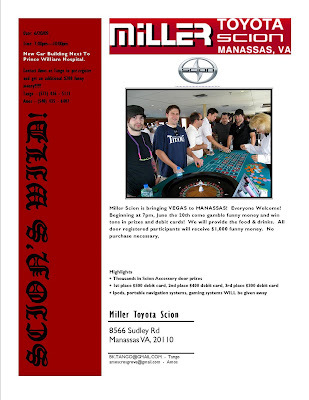 Miller Scion is bringing VEGAS to MANASSAS! Come gamble with Funny Money and win tons in Prizes and Debit Cards! All door registered participants will receive $1,000 Fun Bucks. Front Row Parking for all Scions. Saturday night our New Car Showroom will be transformed into a Casino. There will be two Blackjack Tables, two Roulette Tables, two Texas Holdem Tables, one Craps Table and two Slot Machines. Players can exchange their “Fun Bucks” for chips at any of the gaming tables. Players can take their chips from table to table to try to win as much as possible. Once the tables are clsoed, the dealers will “cash in” the players. For each $100 in chips and/or “Fun Bucks”, the player will receive 1 raffle ticket. Tickets are put into a raffle drum and the numbers are called to determine the winners. Next week I'll start on e-mailing every person that ever bought a Scion here at Millers' since 2004 and also all of the members of Scion Evolution, NoVA and MD chapters. I can't wait. This is going to be a lot of fun and a great chance to see old friends in my Scion family.